Well it was bound to happen, but I'll admit I didn't expect it to happen this quick. We have our first construction error. 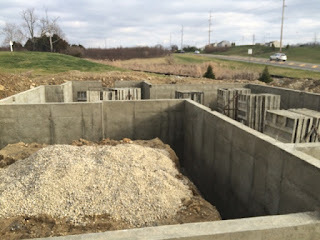 While driving by our construction site the other day, I noticed that, when they poured the basement walls, they forgot to make a notch for one of the basement windows! They put the one in the morning room part of the basement, but they left out the one on the other side of the MR - which is actually the most important one because it's the only window in our "finished" basement space. I brought this to my PM's attention and he seemed to think there was some kind of miscommunication between the contractors. He's supposed to get back to me to let me know how this is going to be handled. I hope they can make it right because I really wanted that window since it'll be the only source of natural light in our "finished" basement space. I'm also a bit disappointed I caught this before anyone on the Ryan Homes side. This is exactly why I'm keeping a close eye on our construction, and y'all should be too. Make sure to at least drive by the site every other day! Well, here's hoping Andrew can get this corrected for us and we'll have a window liked we planned... :/ GO ANDREW! 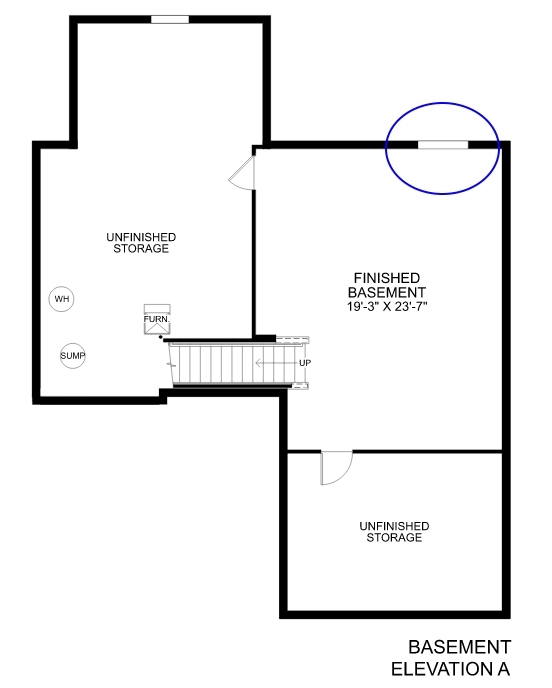 Here's our basement plan. Circled is the window they forgot. Hi Dustin. I'm so sorry to hear this. We had a similar situation where we were told our basement was going to be below ground and and we found out during our dig of the foubdation it was going to be a walkout instead. We were very upset and got Ryan to throw in a few extras for the inconvenience. See if you can do the same. Tell Ryan how they messed up and now they need to throw in a couple of things to rectify their wrong. Thanks Brittany. I think they're going to be able to fix the missing window so that's good, but they are giving us a few extras for the inconvenience! That's a serious miscommunication...I hope you were heavily compensated. Great Dustin! I am glad things are working out in your favor. Prayibg everything else goes smoothly. Thank you Brittany. And John we actually did get them do throw in some extras for the mishap. And they are still going to put the window in too i think. This is why I told you to visit every day. Your PM wont notice this stuff as mine didn't as well. It's sad you have to PM your own build but it will save you headaches later on. John G, do you have a blog as well? I visit the site frequently. Sometimes its not every day but its at least every other day. Caught the missing window the day after they poured but before framing. Still waiting to see if they'll put the window in though. Thanks Ashley! That really is a bummer how far of a drive it is for y'all to visit you're site. I hope it's not a problem though and everything goes smoothly for y'all. The Milan is a very nice model so good choice there and congrats on the approval! Hope everything goes well for y'all. Looking forward to following your progress in your blog! Brittany, yes I did have one but not anymore. I removed it halfway thru my build as it was just a collection of negativity. I stumbled upon your blog via Pinterest! We are going to be building a Milan in Cincinnati! We just had our final selections meeting and I am working on starting our blog for the process!! Hi Ashley, glad you found my blog! Congratulations on your Milan it's a great floor plan if I do say so myself! Wishing you the best as you venture forward and hope you find my blog helpful! Could you please send me the link to your blog once it's up so I can follow your progress? Cheers! I finally got the blog to a point that I can share it, haha!! I look forward to follow the progress on your home, as well as play catch up and then blog about our adventures in home building too!! !